Parents always try to find ways to keep their homes safe for their kids. They put locks on the kitchen cabinets, make the bathroom less slippery, and store cleaning chemicals in places out of their reach. But, while we put a lot of effort into keeping the house clean, organized, and safe, sometimes we neglect a major area: the garage. Your garage serves a lot of purposes. Aside from creating a safe place to park your car, it is also where you keep your gardening tools, store seasonal items, and fix your bicycles and equipment. Making your garage safe at all times is important because you never know when your kids may wander inside without you knowing, and you want to be sure it is always prepared in case that happens. Don’t teach your kids how to use the garage door remote control. They will find it fascinating and inevitably want to try it themselves. Do not let them hold or play with the remote control, and try to prevent them from seeing how you operate it when they are around. Lock the door from your house to your garage. This will make it less likely that your kids will come in and out of the garage without you knowing it. Always remind them that they are not allowed to go inside the garage without your permission. Keep chemicals in high cabinets and lock them. You may never know when there is a curious hand around, so lock all your toxic chemicals away, so your kids will have no way of coming into contact with them. 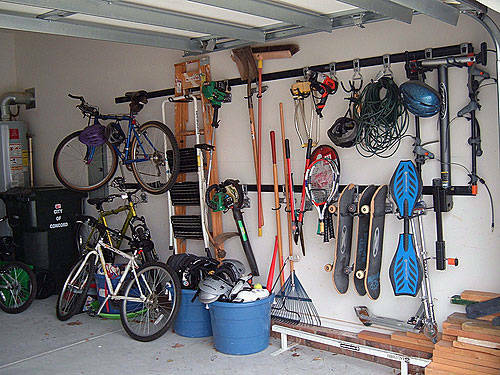 Clean and organize your garage regularly. Do not let tools or other equipment lay around on the garage floor. The tendency to easily trip off and fall is higher if you do not clean your garage regularly. Cleaning and organizing help you know where everything is and also remind you if there are dangerous tools or chemicals around that need to be disposed of. Lock away sharp objects. Even if you use your sharp gardening tools regularly, make it a habit to store them away after use. That way, they won’t be lying around for curious kids to pick up and play with. Remove the keys to your lawn mower and other equipment. If your kids have no way of starting them, they won’t be able to put themselves of danger. Never place your child’s belongings near a dangerous spot. For instance, do not put their bicycles near hazardous chemicals or sharp tools. Make sure also that they can easily reach their things without having to climb on steps or other tools in your garage simply in order to reach their ball or bicycle.